I love Murder She Wrote. Angela Lansbury was one of my favorite female actors growing up. I still can get sucked in to a marathon Murder She Wrote when I find it. And Matlock. They were my pre Law & Order loves. The book I just finished I’d like to bill it as Murder She Wrote in book form and a good Hallmark movie. Cozy mysteries have become my jam in the last year or so. 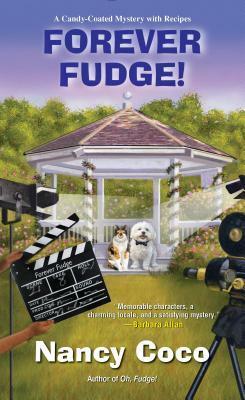 Forever Fudge by Nancy Coco appealed to me because it is set on Mackinac Island, and as a fudgie (person who visits the island) I knew I had to read it! Mackinac Island has such a quaint charm to it. I really want to say on the island sometime. I’ve only done day trips, but I think it would be a perfect destination, in season (summer) or early fall. What you learn at the beginning of the book is that Allie seems to be an amateur sleuth. She and her dog Mal have an uncanny ability to attract dead bodies. She’s helped the police out all ready this summer on quite a few cases. She also has broken up with her boyfriend and another man in town is showing interest. The mystery that happens in Forever Fudge begins when Allie and Mal go outside for Mal to do his doggie business. There while talking with a neighbor, they find a dead body. With the body there is a note. A note that is written TO ALLIE. So begins another mystery. My favorite parts of this book are how the charms of Mackinac Island are incorporated and other Michigan cities. And how the senior center is a hub for island gossip. It basically takes my favorite parts of things and puts them together into this book! I really enjoyed it as an easy to read cozy mystery with local to me ties. Description: When a film crew comes to Mackinac Island, the last thing fudge shop owner Allie McMurphy expects to find is a murder victim . . . It's Labor Day weekend, the official end of tourist season, and the beginning of a whole batch of trouble. First, the island is invaded by a TV crew filming a murder mystery pilot, and handsome Hollywood heartthrob Dirk Benjamin needs Allie's help to prep for his role as local cop Rex Manning. Then, Allie's bichonpoo Mal sniffs out a real murder in the alley behind the Historic McMurphy Hotel and Fudge Shop, a man shot in the head--with a note challenging amateur sleuth Allie to catch the culprit. Like it or not, the fudge maker has to square off against a crazy killer--but this time she may have bitten off more than she can chew . . .
Have you been to Mackinac Island? What is your favorite cozy mystery series? I received this book for review. All thoughts an opinions are my own.